It is a curious thing, but the latest iteration of the Legend of the Five Rings roleplaying game is as much a descendant of John Wick’s 1997 adaptation of the collectible card game as it is the Fantasy Flight Games boardgames, Descent and Doom. Of course, as soon as it was announced that Fantasy Flight Games was going to be publishing the new edition, we all knew that it would be a major redesign rather than a re-implementation of the mechanics seen in the First, Second, Third, and Fourth Editions and we all knew that it would eschew standard numerical polyhedral dice in favour of a proprietary design marked with symbols particular to the roleplaying game, not just in terms of its mechanics, but also as an intellectual property. After all, it is exactly what the publisher did with both Warhammer Fantasy Roleplay, Third Edition and all three iterations of its Star Wars roleplaying games—Star Wars: Edge of the Empire, Star Wars: Age of Rebellion, and Star Wars: Force and Destiny, as well as a Beginner Game for Star Wars: The Force Awakens. Thus, Legend of the Five Rings, Fifth Edition does use proprietary dice and it is a thorough redesign, but the setting remains very much the same, the five elements—or Rings—have been more tightly integrated into the mechanics, and the core ‘Roll and Keep’ mechanic remains. The setting for Legend of the Five Rings, Fifth Edition is Rokugan. It is similar to feudal Japan, but with influences and elements of other Asian cultures, as well as magic and mythical beasts. Known as the Emerald Empire, it has been ruled for a thousand years by the Hantei emperors—the current emperor is Hantei XXXVIII—who have divided it between seven Great Clans. These are the Crab, Crane, Dragon, Lion, Phoenix, Scorpion, and Unicorn clans. Although each is comprised of Samurai—the bushi warriors, mannered courtiers, and shugenja, priests who pray to the kami, or spirits, for aid, each is different in character. The Crab Clan use its strength to man the wall that protects the Empire from the Shadowlands, but its members are regarded as uncouth and ill mannered; the Crane Clan is known as the Left Hand of the Emperor and has many wealthy and influential politicians; the Dragon Clan remains aloof from most affairs in its mountain fast, but has sallied forth to aid the empire several times; the Lion Clan is the Right Hand of the Emperor, being devoted bushi; the Phoenix Clan is known for its shugenja and primarily concerns itself with spiritual matters; the Scorpion Clan is the Emperor’s Underhand and revels in its villainous status and reputation; and lastly, the Unicorn Clan is Rokugan’s cavalry, having spent several centuries in the Gaijin lands to the West. Notably missing from this list is the Mantis clan, which was a Great Clan in some previous editions of the roleplaying game, but essentially, Legend of the Five Rings, Fifth Edition resets the timeline to before it was promoted from a minor to a Great Clan. Our first taster of Legend of the Five Rings Roleplaying—the fifth edition of the roleplaying game—was a ‘beta’, followed by the Legend of the Five Rings Roleplaying Beginner Game, a well-appointed starter box designed to introduce players to both setting and mechanics through ‘The Topaz Championship’, a new version of the classic scenario which had been used to introduce players and Game Masters to Rokugan and roleplaying samurai in previous versions of Legend of the Five Rings. This boxed set provided an explanation of the rules as well as several sample player characters, but only to a limited extent. With the release of the Legend of the Five Rings Roleplaying Core Rulebook, both players and the Game Master have access to the full rules and the means to create and develop the Samurai—the Bushi, Courtiers, and Shugenja (plus Monks in some cases)—who the players will be roleplaying as they explore Rokugan, fulfilling their duty to their clan, their daimyo, and the emperor, all whilst adhering to the tenants of Bushidō and at times being torn between their Giri (duty) and their Ninjō (desire). This all takes place in a setting that is inspired most obviously by medieval Japan, but also by the China and Korea of the period. A character in Legend of the Five Rings is defined by his Rings or core attributes—Air, Water, Earth, Fire, and Void; skills, organised into five categories in order of precedence—Artisan, Martial, Scholar, Social, and Trade; and Endurance representing his stamina and willingness to fight and Composure his capacity to endure mental and emotional pressure. Attached to Composure is a character’s ‘Personal Unmasking’, essentially his reaction after having suffered too much stress—or in game terms, ‘Strife’. For example, when Strife exceeds a bushi’s Composure, he might see the cause of it as a loss of face and demand an honour duel. A character’s standing in the world is represented by his Honour, Glory, and Status stats, whilst his Clan and Family represent his background and his School is his career. Character creation is structured around ‘The Game of Twenty Questions’. This has always been part of character creation in Legend of the Five Rings. In previous editions of the roleplaying game, it has felt supplemental to the process, but in Legend of the Five Rings Roleplaying it is integral to the character creation process. So in turn, the questions ask what clan and family a character belongs to, what his role and school are and what he was like at school, who his lord is and what his duty is to him, relationship to his clan, what he thinks of Bushidō, his greatest accomplishment, what holds him back, what he does to feel at peace, what his troubles are, who he learned from the most, what is most noticeable about the character is, how he reacts to stressful situations, his relationships, what his parents think of him, who was he named to honour, the character’s personal name, and how he should die. Although lengthy, answering these questions will help a player determine his character’s core identity, role and school, honour and glory, strengths and weaknesses, personality and behaviour, ancestry and family, and death. In addition to determining a character’s Rings, Skills, Advantages and Disadvantages, Honour, Glory, and Status, the process gives a character his School and first School Ability. It also gives several Techniques which a player can choose from, further special abilities appropriate to his character’s school. These are categorised into Kata, Kihō, Invocations, Rituals, Shūji, Mahō, and Ninjutsu. Kata are combat techniques; Kihō are used by monks to align their ki with the elements and the universe; Invocations are prayers used by shugenja to speak to the kami and engage their aid; Rituals are lengthy ceremonies conducted by priests and spiritualists for various esoteric effects, such as sanctifying a group or person; Shūji are the social and verbal equivalent of Kata; Mahō is blood magic employed by the evil followers of of Fu Leng; and Ninjitsu are the secret techniques of the honourless Ninja. Although these Techniques use the same mechanics, what matters are their differing effects and opportunities they provide a character with when they use them. Our sample character is Doji Maruko, a loyal and honourable member of the Crane Clan. Known for his creativity at school, he is currently in the service of Lady Doji Fujie as a scribe. His duty is to write the letters she is no longer capable of due to the arthritis in her hands. He dreams of becoming an artist renowned for both his brushmanship and his poetry. There are some who say he is attempting to make up for his short stature, whereas he is actually overcompensating for a childhood fall which left him partially deaf. It did not help that his father, the poet Doji Rhihito, pushed him with little regarded for his lack of hearing. He is always finely dressed, but sometimes there are ink stains on his clothing and his grandfather’s calligraphy set is never far from his possession. Maruko is named for your grandfather, who was a famous poet in his day. Mechanically, Legend of the Five Rings Roleplaying uses a ‘Roll and Keep’ system. What this means is that when a player character takes an action, his player rolls a number of dice—typically equal to a Ring and Skill or just a Ring—and keeps a number of dice equal to the Ring. For this, Legend of the Five Rings Roleplaying uses two types of dice. One type is the six-sided, black Ring dice, the other is the twelve-sided, white Skill dice. Both are marked with a mix of four symbols. These symbols are ‘Success’, which indicates a character’s effective at an action or skill; ‘Explosive Success’, which counts as a ‘Success’ and enables another die of that type to be rolled if the ‘Explosive Success’ is kept; ‘Opportunity’, which provides positive, incidental benefits; and ‘Strife’, which are primarily negative effects on a character’s emotions. Where Strife can be accumulated until a character suffers an unmasking and shows his inner emotional turmoil, Opportunity can spent to remove Strife, to spot a particular detail, to perform the task in a pleasing fashion, and so on. Yet it is not merely a case of rolling the dice. To undertake an action, a player needs to set three things for his character. The first action is to set an Approach—or ‘Stance’ in combat—but which one is determined by a character’s Rings. An Air Approach is graceful, cunning, and precise; an Earth Approach is steady, grounded, and thorough; a Fire Approach is direct, ferocious, and inventive; a Water Approach is balanced, flexible, and perceptive; and a Void Approach is enlightened, centred, and mystical. Each Approach indicates the Ring to use as well as provide certain advantages with conflict Stances. The second is to select the skill and the third is for the player to roll the dice and decide which to keep—preferably those with the most Successes and Opportunities. If the number of Successes exceeds the Target Number, two being the average Target Number, then the character has succeeded. After that, the player spends any Opportunities rolled and totals up any Strife rolled. This is simple enough, but it is not merely a matter of a player selecting their character’s best Ring and rolling that in combination with the skill, for although that may have advantages in terms of the more Successes and Opportunities that can be rolled, it may not be the right Approach. Thus, if a samurai needs to get across a river via a rotten log, the skill to be used would be Athletics. Using a Fire Approach would enable a character to run across quickly without any danger of it collapsing under him, but with the possibility of his slipping off into the river. Alternatively, an Earth Approach is slower and more measured, with little likelihood of the character slipping off the log, but with the possibility of the log splitting under his weight. For example, Doji Maruko is at winter court and is engaged in a poetry competition with Ikoma Jun’ai, an Ikoma Bard of the Lion Clan. The competition involves taking it in turn to refine each participant’s composition through the turn of the season as well as assessing each refinement. Ikoma Jun’ai has already composed the first poem and Lady Fujie turns to Maruko to ask what he understands of the composition. The Game Master rules that the first is a Void or Attune Approach if Maruko is to understand Jun’ai’s deeper meaning. The Target Number is two and Maruko’s player will roll one Ring die for Maruko’s Void and three Skill dice for his Composition, but only keeping one for his Void. The results of his roll are an ‘Explosive Success’ and a ‘Strife’, a ‘Success’ and an ‘Opportunity’, a ‘Success’, and a blank. Since Maruko needs two Successes, he keeps the ‘Explosive Success’ and the ‘Strife’, and rolls another Ring die for the ‘Explosive Success’. He gets the same result—an ‘Explosive Success’ and a ‘Strife’, enabling to roll a third Ring die. This gives him an ‘Opportunity’, the final result is two Successes, two Strife, and an Opportunity. Maruko’s player notes down the Strife and the Game Master explains that Jun’ai’s winter composition has subtly alluded to the chilly reception extended to the Lion Clan at this year’s winter court. Maruko’s player says that the Strife represents Maruko’s learning of the subtle insult and that he will use the Opportunity to lower the Target Number of Maruko’s next task as it will use a Ring other than Void. Now it is Maruko’s turn to compose a piece of poetry, one derived from Jun’ai’s winter composition, but adapting it to the theme of Spring. This is an Adapt Approach and so will use Water. This means that his player will be rolling three Ring dice and three Skill dice as Maruko has a Water of three and a Composition skill of three. The Target Number would normally be two, but this is lowered to one by the Opportunity from the previous roll. He rolls an ‘Explosive Success’ and a ‘Strife’ twice, a ‘Success’ and a ‘Strife’ twice, and two ‘Opportunities’. From these, he elects to keep both of the ‘Explosive Success’ and ‘Strife’ results, plus a ‘Success’ and a ‘Strife’ result. He can roll more dice for the ‘Explosive Success’ and ‘Strife’ results. These generate another ‘Success’ and ‘Strife’ result plus an ‘Opportunity’ and a ‘Strife’ result. Altogether, Maruko has the following results—four successes, five Strife, and an Opportunity. Maruko has successfully adapted Jun’ai’s winter composition into a spring poem and works in meaning that the Lion should be more energetic in his hunt for a warming welcome. Since Maruko has now accumulated a total of seven Strife through the effort, his player is concerned that Maruko will accumulate too much in the next exchange and under the critical eye of Lady Fujie and Jun’ai’s implied criticism of the Crane Clan, Maruko’s Composure will be compromised and he be unmasked. He thus decides to use the Opportunity to take a calming breath and negate some of the Strife. In comparison to previous editions of the Legend of the Five Rings roleplaying game, the one skill missing is that of ‘Investigation’. This is covered every aspect of conducting an enquiry or spotting things and because it was coupled with the Awareness and Perception stats, it was representative of how particular Rings were attached to certain Skills. In Legend of the Five Rings Roleplaying, the old Investigation skill is replaced by a derived value, Vigilance. This becomes a Target Number for others to roll against when trying to avoid a character’s attention. Meanwhile, actual investigative actions carried out by characters are rolled for by their characters using an appropriate skill. So to determine the extent of a criminal’s crime, a bushi might roll an Earth and a Skulduggery check, but to work out why someone at court might be flustered, a courtier might roll Water and Sentiment. What this represents is the uncoupling of Rings and Skills for a more flexible approach to actions in the game. Another aspect of Legend of the Five Rings Roleplaying is that in terms of design and mechanics, it does not fundamentally differentiate between its types of conflict scenes. Although there are technical variations, Social conflicts or intrigues, duels between individuals, skirmishes between small groups, and mass battles are all handled by the same core rules. The participants roll initiative, then from round to round, they set their stance which will determine how they will engage in the conflict and what Ring dice they will roll, and then roll for their action and resolve its outcome. Throughout, it is not necessarily enough for a player to roll the required number of successes to equal or exceed the given Target Number—either one, two, or three—but often he needs to roll Opportunities in order to gain extra benefits. These include working as a descriptor to show how a character does something, such as Air for doing it with precision, stealth, or subtlety, or as a narrative device, to add further details, such as with Fire to discern the motivations of others, gain insight, or notice absences. Now despite Legend of the Five Rings Roleplaying employing a standardised set of mechanics and rules, supported by the Techniques which nicely provide each type of character—bushi, courtier, shugenja, and monk—with their own special abilities, it is with Opportunities where the mechanics get slightly more complex. This is because there is a plethora of different types of Opportunities to found in the mechanics, especially once the Techniques come into play, because every Technique is different. Character progression is built around the expectations of the character’s School. A player is free to spend his character’s Experience Points on whatever Rings, Skills, and Techniques he wants for the character. The character’s School expects him to learn particular Skills and Techniques though, so if he instead learns Skills and Techniques outside of that curriculum, the Experience Points spent on those only count as half their value towards the total required to attain the next Rank in the School. For example, a Lion bushi is expected to train in Martial Arts (Melee) and particular Kata rather than the Courtesy and Sentiment skills and whilst he will gain the skills, he will not not have improved himself enough to further advance to the next Rank. The Rank by Rank—up to Rank 6—curriculum feels reminiscent of an earlier roleplaying game from Fantasy Flight Games, Warhammer Fantasy Roleplay, Third Edition, which used more complex, but not dissimilar mechanics and a progression curriculum organised career by career. Beyond the mechanics themselves, Legend of the Five Rings Roleplaying provides a full list of equipment with which to arm and equip the player characters and their enemies. The Game Master is given good advice on her role and on running the game, with a particular focus on using social abilities—honour, glory, and status—in play. There are also suggestions as to alternative campaign styles, including campaigns where the players roleplay non-samurai or are samurai on great quests with the fate of the realm at stake. The former provides rules for creating characters of a Peasant origin, whilst the latter gives rules for creating Nemurani, the arms, armour, and artefacts infused with the kami. Lastly, there is a good bestiary of creatures, men, and monsters, both mundane and supernatural. Understandably, much of the core rulebook for Legend of the Five Rings Roleplaying is going to focus on the rules, especially given the intricacy of those new rules in terms of narrative rather than in absolute results. As well presented as those rules are, this does not leave a great deal of room for background to the Rokugan and the setting in general. What there is, is quite broad, such that anyone new to the game and setting may have difficulty knowing where to start. Of course, this will not be an issue for anyone familiar with the setting and anyway, a playing group could play through ‘The Topaz Championship’ from Legend of the Five Rings Roleplaying Beginner Game and its sequel scenario if it has not already done so. That said, it would have been nice if Legend of the Five Rings Roleplaying had acknowledged those familiar with the setting via earlier editions of the roleplaying game, since they are actually more likely to be coming to this edition of the roleplaying game than fans of the associated card game or samurai drama. Especially as Legend of the Five Rings Roleplaying is not written as roleplaying game for anyone new to the hobby. Another issue is that for anyone coming to Legend of the Five Rings Roleplaying from either the Legend of the Five Rings Roleplaying Beginner Game or the preceding beta version of the rulebook is that there are changes between them. Now this is to be expected, but some of those changes to the rules are between Legend of the Five Rings Roleplaying and the Legend of the Five Rings Roleplaying Beginner Game rather than the beta. This makes adapting from the latter to the former not as smooth as perhaps it should have been. Physically, Legend of the Five Rings Roleplaying is a lovely hardback. It is clearly written and it is illustrated with some excellent artwork which captures both the serenity and the strife intrinsic to the setting of Rokugan. One absolute well-chosen touch is that the Ninjutsu Techniques are presented not on the standard buff-coloured pages, but across a two-page spread depicting city rooftops at night. It is such a perfect touch. Another useful element to Legend of the Five Rings Roleplaying is the character sheet, which although not included in the core rulebook, is designed so that all of a character’s core stats and narrative information is recorded on the front, whilst all of the conflict information is recorded on the back, so that when the game switches to a conflict scene, all a player has to do is flip the sheet over and everything necessary is there right in front of him. For anyone who has played a previous edition of Legend of the Five Rings, they will find a great deal that is familiar in terms of setting, background, and what they can play in the new addition. They will also find a new set of mechanics that at their core are simple and standardised across the various aspects of Legend of the Five Rings Roleplaying. The new element of being able to combine any Ring with any Skill depending on the Approach—or how a samurai wants to do something—is not quite as simple, but it does give both characters and the game great flexibility, whilst the use of Strife and Opportunities allow for narrative elements to be more emphatically brought into play via the mechanics. 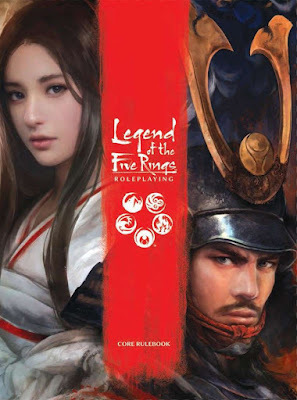 Although the new rules are intricate in terms of the narrative elements they are bringing into play, Legend of the Five Rings Roleplaying explains them well and does a good job of establishing the mechanics in support of the supplements and scenarios to follow.